A while ago I mentioned that I would write something about sea ice. The context was a talk I gave at the 2017 Pint of Science festival in Canberra. It was really quite fun, despite being totally terrified and full of the ‘what ifs’… ten minutes before stepping in. Thanks to some great tips from a Canberra Innovation Network science communication workshop I managed to get it done. Anyway, The aim of that talk was to give a brief sea ice overview and then show what it’s like as a scientist working in the field – how we think, how we try to solve problems and potential new techniques we see which can help. The audience was quite impressive – they grasped the material with two hands and had insightful, interesting questions. It was heartwarming. …but none of that is about sea ice at all. That was all about a talk! So go and read it yourself here and learn more: https://adamsteer.github.io/talks/pintofscience2017/#/ – it uses Reveal.js – so you can use your arrow keys to move around it either linearly (down, then right, then down) or go around how you please. Press ‘s’ to see speaker notes, I’ll finish those in the next week while I’m travelling to FOSS4G. Most importantly, it explains the sea ice/beer cycle. This is really an under-studied earth system component and needs massive grant funding and more fieldwork. I mean it! Seriously! 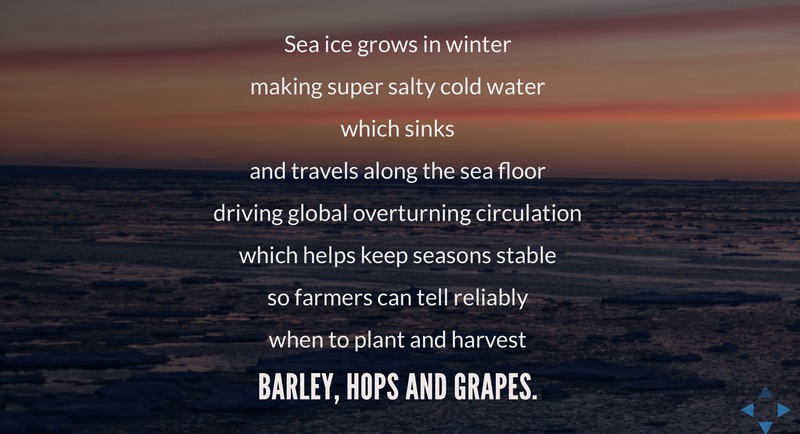 Without detailed knowledge of sea ice thickness gained by combining many instruments and rigorous field surveys, we will always be nervous that our beer is at risk. You can also see a deeper dive ( a PhD thesis in 20 or so slides) here – also in Reveal.js: adamsteer.github.io/talks/phd.wrapup . I hope those slide decks are digestible and leave you with something you didn’t know before – the sea ice/beer cycle for one; but also how sea ice gets measured and just a few of the issues surrounding how to make a realistic assessment about how much sea ice exists on the southern ocean. It’s super-complex! It’s also about the most mind blowing place I’ve ever been – we don’t need to go to Mars.. the pack ice zone is much closer and still a totally foreign world.